10th January 1903, Wakefield, Yorkshire, England. Barbara Hepworth was the daughter of a County Surveyor. Wins a Scholarship to Leeds School of Art. Royal College of Art, London. 1920: Hepworth meets Henry Moore at Leeds School of Art. 1921: She moves on to the Royal Academy of Art in London. 1924: After graduating she moves to Florence to study Romanesque and early Renaissance Sculpture with her new husband John Skeaping. Moves on from Florence to Rome. 1928: Hepworth holds her first one-person exhibition at the Beaux Arts Gallery in London. Moves to Parkhill Road, Hempstead, London. 1932: She meets to artist Ben Nicholson and joined the “Seven and Five Society of Artists”. Produces her first pierced form sculpture. 1933: She becomes a member of the Abstraction-Creation Association. and of the “British Unit One Group”. 1935: By now all her work is abstract with the renewed influence of Nicholson. 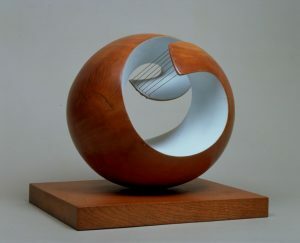 1939: Hepworth began using colour in her work. 1940: She moved to St. Ives in Cornwall. 1949: Hepworth buys the Trewyn Studios in St. Ives. 1950: Exhibits at the Venice Biennnale. 1951: Divorce from Nicholson. She moves into the Trewyn Studios where she lives until her death. Exhibits “Contrapuntal Forms” at the Festival of Britain. 1953: Hepworth produces “The Unknown Political Prisoner”. 1959: Wins the Grand Prix at the Sao Paulo Biennale for one of her Bronze works, a medium she started to use in the late 1950’s. 1962: Hepworth commissioned to create the “Winged Figure” on the John Lewis Building in London. 1964: She produces “Three Monoliths” in Marble. 1965: She is created a Dame of the British Empire. 1973: Hepworth suffers from throat cancer. November 1938 to Ben Nicholson. (Divorced 1951). 20th May 1975, Trewyn Studio, St. Ives, Cornwall, England after a fire. Carbis Bay Cemetery, Cornwall, England. Barbara Hepworth Studio, Trewyn, St. Ives.